A Chinese man wrongly diagnosed with AIDS is fighting an uphill battle for compensation, The Paper, a state-run publication, reported May 18. 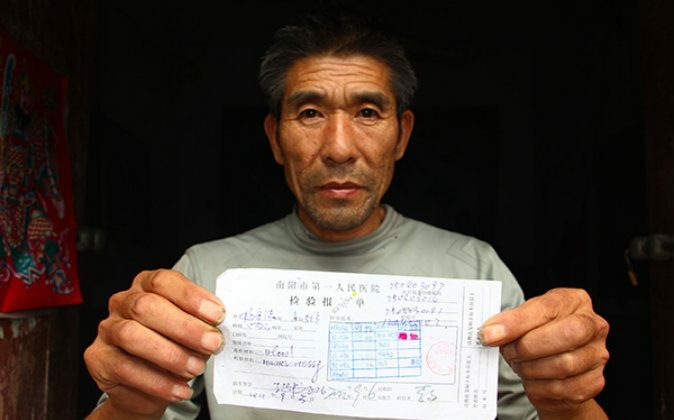 The ten-year ordeal of Yang Shoufa, a 53-year-old farmer living in Henan Province, central China, began in late 2003 when he underwent a blood test for a health survey. The doctor informed him that he was infected with “that kind disease,” meaning AIDS. The diagnosis was corrected only in 2012, by which time Yang’s life was already in shambles. AIDS is frighteningly common in rural Henan, one of the poorest parts of China. Many people in Yang’s village contracted AIDS from selling blood. Because Yang had also sold blood, he didn’t doubt the results of the test. For nearly a decade, until Yang got his condition re-diagnosed, he lead the life of a “condemned prisoner.” Though Yang did not in fact have AIDS, the placebo effect and social ostracization he suffered was enough to make his life akin to that of a “condemned prisoner.” described as an energetic and hardworking man. Already poor, Yang’s wife decided to leave him. Though her first attempt at divorce was rejected, she later invented a story saying that she had been abducted and sold into marriage, which the court accepted in 2011. Yang considered suicide many times in the following years. Not knowing how long he had left, he would wolf down copious amounts of meat in hopes of gaining extra nutrition. Sometimes he would eat a whole chicken for his meal. At first, Yang tried to keep his AIDS diagnosis from his family, but his son accidently discovered and read the documents. This led to the wife’s decision to leave Yang, and it further divided him from his family. His children rarely see him and he maintains minimal contact with neighbors. His house collapsed for want of repairs, and Yang now lives in a spare home owned by his brother. In 2012, Yang went to the No. 1 People’s Hospital in the city of Nanyang to treat a severe ailment. He had been taking much medicine to treat his nonexistent AIDS; the associated side effects had taken a serious toll on his health. To his surprise, hospital staff said that Yang did not have AIDS, but was suffering from an inflamed esophagus, stomach, gall bladder, and swelling of the prostate gland. “Having taken pills for ten years without any real disease, it’s no wonder I ended up this sick,” Yang, who had exhausted his savings on medicine, told The Paper. When Yang tried to get the misdiagnosis investigated at the local disease control and prevention center, he spent half a year negotiating red tape and empty excuses. Meanwhile, the pension he received for his status as an AIDS patient was cancelled, and the 2 million yuan (about $306,000) compensation he is looking for to cover damages seems unlikely: officials told him he can be compensated a tenth that amount. These days, Yang makes his living as an unlicensed tricycle can driver, making about four and a half dollars a day. He subsists on noodles and seldom has vegetables. After news of his plight spread online, the local health authorities began sending Yang ham and eggs. Yang tried to get an explanation from the local disease control and prevention center, of the cause of misdiagnosis, half of a year has passed, there was no answer but only empty excuses. His AIDS subsidy was cut off, he filed for two million yuan compensation complaint, but was told that he can only be compensated for maximum of 250,000 yuan. It’s uncertain if Yang will be able to remake his life. He has no savings and poor health. He isn’t optimistic: “I’m living like a ghost of a man,” he said.